Citation: Wang R, Weng G, Huang L, et al. Covered stent graft for distal stent graft-induced new entry after frozen elephant trunk operation for aortic dissection. Ann Cardiovasc Thorac Surg 2018;1(3):57-62. Background: The aim of the study was to present our experience with covered stent graft to close the tear induced by distal stent after Frozen Elephant Trunk operation (FET). Methods: From November 2012 to July 2015, 21 patients suffering from distal Stent Graft New Entry (d-SINE) after FET accepted interventional treatment with a covered stent graft. Computer Tomographic Angiography (CTA) was performed at 3, 6 and 12 months after surgery to observe the position and shape of the stent and the eventual endoleaks. Results: All patients were implanted with a covered stent graft. After surgery, angiography showed that the stents were in the proper position and fully expanded. Two patients died after surgery. Followup was 24-55 (mean, 40 ± 10) months. No stroke, paraplegia, or death occurred. CTA showed that the stents had a proper form and were in the correct position without any displacement or endoleak. False lumen expansion did not occur. Parts of the false lumen showed thrombosis. Conclusion: The results suggest that implantation of covered stents in the descending aorta to manage d-SINE after FET may achieve a good therapeutic effect. An aortic dissection is the disruption of the thoracic aorta media layer due to intramural bleeding causing the separation of aortic wall layers and leading to the formation of true and false lumens, with or without communication [1-4]. The Stanford classification classifies aortic dissections according to type A (affecting the ascending aorta, regardless of origin) and type B (affecting the descending aorta, regardless of origin) . The true incidence and prevalence of aortic dissection are difficult to determine because of the rapid fatality, with the death often being attributed to other causes . Frozen Elephant Trunk operation (FET) is one of the commonly used methods to treat Stanford type A aortic dissection [1-4]. This approach can eliminate the proximal tear of the dissection, expand the true aortic lumen, and promote the closure of the false lumen at the section of the stent [5-7]. Generally, the size of the stent vessel will be determined by the diameter of the true lumen at the descending part of the aortic arch [5-7]. But sometimes, the diameter of the true lumen of the descending aorta is smaller than that at the descending part of aortic arch, and then the stent will be too large for the true lumen of the descending aorta. In these cases, because of the relatively fragile intima of the aortic dissection, new tears will emerge under the damaging effects of the stent against the intima, resulting in distal stent graft-induced new entry (d- SINE), where the false lumen of the descending aorta will expand. The surgical treatment indicated for such patients is chest-abdomen aorta replacement, which is a complicated procedure with high morbidity [8-11]. At our center, covered stent grafts are used to close the distal endoleak of the stent, where the distal anchorage area of stent will be selected properly according to the pathological changes. The present study aimed to describe our experience with covered stent graft to close the d-SINE after FET. From November 2012 to July 2015, 21 patients (six from other hospitals and 15 from our center) suffering from d-SINE after FET accepted interventional treatment with a covered stent graft. Table 1 presents the characteristics of the 21 patients. This study included 20 males and one female. Age ranged from 27 to 61 years (mean, 48 ± 9 years). A d-SINE has been found for all patients by postoperative CTA, including four patients suffering from distal endoleak right after surgery and before discharge. For the 17 remaining patients, the endoleak was diagnosed 6-60 months (mean, 22 ± 17 months) after the first surgery. If the distal thoracic diameter was >5 cm, open surgery was performed; those cases were excluded. AAR: ascending aorta replacement; SET: stented elephant trunk; DASG: descending aorta stent graft; M: male; F: female; BD: before discharge. Table 1: Clinical characteristics of the patients. The institutional ethics committee approved this study and waived individual consent because of the retrospective nature of the analysis. Ascending aorta replacement+FET has been performed in 11 patients. Bentall+FET has been performed in six cases. Descending aorta stent graft (type B dissection, tear near left subclavian artery) has been used during surgery for four cases. The stent vessels used for the first grafting were all minimally invasive ones; 14 patients received stents of 26 × 100 mm and seven received stents of 28 × 100 mm. The stent diameter has been originally selected based on the diameter of the blood vessel. No embolization has been performed. The same clinician (a chief surgeon with >20 years of experience) conducted all operations. The patient was placed in the supine position. Local anesthesia and potentiated anesthesia were performed. The right femoral artery was dissociated and 6000 units of heparin were given. The right femoral artery was punctured and a 5F platinum pigtail catheter was inserted to the upper segment of the abdominal aorta. Aortic angiography was performed for the initial segment of the descending aorta and the ascending aorta to show the stent distal endoleak. With precise positioning, a covered stent was sent from the right femoral artery to the stent distal endoleak and released when overlapping with the stent used in the first surgery in order to isolate the stent distal endoleak. Aortic angiography was performed again to observe whether the location and shape of the stent could ensure that the d-SINE was isolated successfully (Figure 1). If angiography revealed that the true lumen at the distal anchorage area of the covered stent graft was too small or if the curvature of the aorta was relatively large (i.e. if the diameter of the true lumen was over 20% different from the diameter of the stent, or if the blood vessel was evidently bent), an Optimed bare stent (Optimed Medizinische Instrumente GmbH, Ettlingen, Germany) was implanted in advance to the intended anchorage area. The proximal end of the covered stent graft was released when connected with the stent used in the first surgery. The distal end was located in the bare stent, which would prevent the stent distal endoleak recurrence. In the present study, covered stent graft + bare stent graft were used for four patients. Figure 1: (A) Computer tomographic angiography showing the distal endoleak of the stent graft. (B) Aorta angiography showing the distal endoleak of the stent graft before intervention (red arrow). (C) Aorta angiography after implanting the covered stent + bare stent (blue arrow), showing that the endoleak has been sealed successfully. To select the approach of the covered stent graft (Medtronic, Fridley, MN, USA and MicroPort Scientific Corp., Shanghai, China), the diameter of the stent in the descending aorta was measured and the proximal diameter of the covered stent graft was determined as being 15% larger. The diameter of the true lumen of the descending aorta was measured to determine the distal diameter of the covered stent graft. Tapering stents were used for patients in this group, ranging from 4 mm-6 mm, with the proximal diameter of the covered stent graft being 30 mm-34 mm, the distal diameter was 24 mm-28 mm, and the length was 160 mm-200 mm (Grikin; Grikin Advanced Material Co., Ltd, Beijing, China). If the true lumen of the descending aorta was too small to be grafted with a tapering stent, a bare stent was added at the distal end of the stent to prevent new tears. In the present study, one patient with a large tear at the distal end of the stent and level tear at the coeliac trunk received two covered stent grafts to cover the proximal end of the tear on the superior mesenteric artery. The stents were 32 × 26 × 160 mm and 30 × 26 × 160 mm, respectively. 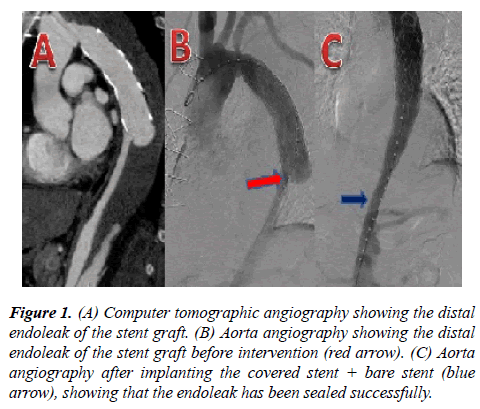 Computer Tomographic Angiography (CTA) was performed at 3, 6 and 12 months after surgery to observe the position and shape of the stent and eventual endoleak. Changes of the true and false lumens of the aorta were observed, with or without dilatation. Thereafter, aortic CTA was performed each year. Only descriptive statistics were used. All patients were implanted with covered stent graft. After surgery, angiography showed that the stents were in the proper position and fully expanded. CTA showed that the coeliac trunk artery, superior mesenteric artery, and bilateral iliac artery were well developed. For one patient with tears on the coeliac trunk, a covered stent graft was used to cover the proximal end of the superior mesenteric artery. CTA of the descending aorta performed after stenting showed that the superior mesenteric artery was well developed. No perioperative stroke, paraplegia, or any other complication occurred in 19 patients. Two patients died after surgery. One day after being treated by ascending aorta replacement+FET, the first patient showed abdominal distention, disappearance of bowel sound, and continuously increasing lactic acid levels. CTA performed on the following day after surgery showed that the stent was grafted into the false lumen; the aortic true lumen was small and ischemia of the coeliac trunk artery and superior mesenteric artery was caused by blood flow reduction. A covered stent graft was implanted to connect with the stent used in the first surgery to lead the blood back in the true lumen. CTA showed that parts of the true lumen were open, with the coeliac trunk artery, superior mesenteric artery, and renal artery being well developed. The patient died eventually due to irreversible intestinal necrosis, liver failure, and digestive tract hemorrhage caused by the rapid progression of gastrointestinal ischemia. Aortic CTA showed that the stent of the second patient formed an angle of 90° with the descending aorta. The distal end of the stent presented a large overflow of contrast medium. The distal tears were successfully isolated after the first stent was grafted, but the correcting effect on the angle was unsatisfactory. To prevent the original stent from puncturing the newly-grafted one, the second stent was implanted to the section of the descending aorta stent and released when they were seen to overlap. Ascending aorta angiography was performed after the stent was fully released and showed that the stent angulation has been corrected. Four days after surgery, a huge aneurysm appeared, due to hematoma around the stent, and oppressed the left trachea, resulting in dyspnea. The patient died despite trachea cannulation. Follow-up was performed for the 19 patients who survived surgery. The follow-up was 24 to 55 months (mean, 40 ± 10 months). No stroke, paraplegia, or death occurred. CTA showed that the stents had proper form and were in the correct position, without any displacement or endoleak. Ture lumen were larger than pro-operation, False lumen expansion did not occur. Parts of the false lumen showed thrombosis 3 monthes post-operation. FET is one of the commonly used methods to treat Stanford type A aortic dissection, but FET can cause new tears when the diameter of the true lumen of the descending aorta is smaller than the diameter at the descending part of the aortic arch [8-11]. Therefore, this study aimed to present our experience with covered stent graft to close the distal stent-induced tear after FET. The results suggest that implantation of covered stents in the descending aorta to manage d-SINE after FET may achieve a good therapeutic effect. Ascending aorta replacement or hemi-arch replacement is the traditional surgical method to treat Stanford type A aortic dissection [1-4] For 50%-70% of patients suffering from type A aortic dissection, blood flow is still present in the false lumen of the descending aorta, which may cause dilation of the aorta, and about 13%-15% of such patients will need a second surgery within five years [12-16]. To improve the therapeutic effect and reduce the reoperation rate, entire arch replacement combined with FET has been increasingly used for type A aortic dissection [1-7]. In FET, a length of artificial blood vessel with a self-expandable stent is inserted into the descending aorta to close the intimal tears in the descending aorta and to promote thrombosis in the false lumen of the descending aorta, thereby eliminating blood flow in the false lumen and reducing the dilation of the descending aorta, and hence the reoperation rate [17-20]. Studies showed that entire arch replacement combined with FET could bring obvious improvement in the 5-year survival rate, 5-year reoperation rate, and blood flow in the false lumen compared with ascending aorta replacement or hemi-arch replacement . FET greatly improved the outcomes of patients with type A aortic dissection [5-7], [17-21]. Nevertheless, some FETrelated issues emerged. Indeed, some patients experience distal endoleak of the stent vessel and new tears occur due to tearing of the intimal flap at the distal end of the stent, followed by reflowing of blood in the false lumen of the descending aorta [8-11]. Those with larger tears will experience dilation of the false lumen, which will increase the pressure inside the false lumen and affect distal blood perfusion. In the present study, stent distal endoleak occurred at different times after FET, including right after the first surgery or after a few months or even years. Eleven patients had no clinical symptoms. These patients were all with small tears and without significant dilation of the false lumen according to CTA after surgery. Five patients sought medical advice because of sudden pain in the chest and back. CTA showed that four patients with abdominal distending pain had insufficient blood supply to abdominal organs. These patients were all with large tears and obviously expanded false lumen causing pressure on the true lumen. One patient consulted because of back pain and hemoptysis. Angiography showed that the stent formed a 90° angle with the descending aorta, resulting in pressure on the trachea by the hematoma around the stent. Among all patients, hypertension was the primary disease for 16 patients and Marfan Syndrome for five patients. Based on our experience, new tear induced by the distal stent graft is related to the following factors: release of the stent vessel, selection of the size of the stent vessel, and postoperative control of the blood pressure. For the two patients who died, the stent vessel was released into the false lumen in one patient. In the other one, the stent vessel formed a 90° angle with the descending aorta resulting in aortic rupture, which was caused by errors when releasing the stent vessel. When the stent is too large for the true lumen of the descending aorta, the radial supporting force of the self-expanding stent causes tears in the fragile aortic intima. Studies reported that the probability of tearing the aortic intima will significantly increase when the mismatch rate between the stent and the inner diameter of the true lumen of the descending aorta is >120% [22-24]. Preoperative CT measurement and intraoperative direct observation of the size of the aortic true lumen are mainly used to select the size of the stent. Direct observation should prevail because the true lumen lies in a shrunken state when CT measurement is taken before surgery. The aortic arch is curved and the curve will be somewhat forced a little when inserting the stent vessel into the descending part of the aortic arch to obtain a consistent curve with that of the descending part. Nevertheless, just like a spring, the self-expanding stent has a tendency to restore its original straight shape when the stent is released, which will produce a tangential force that will tear the fragile aortic intima when the force reaches to a certain extent. In the present study, the primary disease for 16 patients was hypertension. Uncontrolled blood pressure after surgery may also be the reason for aortic intima tear after FET. New tear induced by the distal stent graft will cause false lumen dilation, resulting in the possibility of aortic rupture, and pressure on the true lumen, which may result in insufficient blood supply to abdominal organs. Therefore, active treatments such as thoraco-abdominal aorta replacement shall be undertaken for patients suffering from distal endoleak of the stent vessel, but this approach is associated with high morbidity and complications [8-11]. Interventional therapy with covered stent graft is now widely used to treat type B aortic dissection [25,26]. Distal endoleak of stent vessel is equivalent to B-type aortic dissection. Thus, interventional therapy is commonly used at our center to deal with distal endoleak, for which covered stent graft will be grafted to cover the new tear induced by the distal stent graft. This could lead to embolization of the false lumen, with good outcomes . The most worrisome issue is that the multi-segment intercostal arteries may be covered using such an approach, with a risk of spinal cord ischemia. A study reported that arteries on the coeliac trunk enjoy abundant connection with the superior mesenteric arteries and that it may be safe to cover the coeliac trunk . One patient in the present study had tears near the coeliac trunk. With the need to cover the coeliac trunk, the stent covered the proximal end of the superior mesenteric artery. After surgery, no abdominal distention and paraplegia occurred. This approach could probably be safe and effective since no patient experienced paraplegia during follow-up. For patients with small aortic true lumen, we first placed a smallcaliber bare stent and then a covered stent graft that was released when the proximal end of the covered stent graft connected to the stent of the first surgery, while the distal end was in the bare stent, where new distal endoleak of stent could be avoided. Some authors suggested an approach similar to ours, but in different contexts. Idrees et al. suggested a hybrid repair to manage retrograde ascending dissection after Thoracic Endovascular Aortic Repair (TEVAR). Weng et al. showed that distal endograft implantation could successfully be used to manage stent graft-induced new tear. Nevertheless, additional studies are still necessary to provide data in a broader range of patient types. The present study is not without limitations. The sample size was small and from a single center. In addition, the study was retrospective and the patients were highly selected. Finally, there was no control group. Additional studies are necessary to determine the benefits of this approach. Mismatch between stent vessel and aortic true lumen and errors on releasing the stent vessel are probably the main reasons for new tear induced by the distal stent graft after FET. Treating distal endoleak of the stent vessel with implantation of a covered stent graft in the descending aorta could be an appropriate minimally invasive approach and achieve a good therapeutic effect. The approach of using a covered stent graft together with a bare stent could effectively avoid recurrence of d-SINE. This study was supported by the High level hospital construction scientific research joint fund project (2017LHJJ01). Hiratzka LF, Bakris GL, Beckman JA, et al. 2010 ACCF/AHA/AATS/ACR/ASA/SCA/SCAI/SIR/STS/SVM Guidelines for the diagnosis and management of patients with thoracic aortic disease. A Report of the American College of Cardiology Foundation/American Heart Association Task Force on Practice Guidelines, American Association for Thoracic Surgery, American College of Radiology, American Stroke Association, Society of Cardiovascular Anesthesiologists, Society for Cardiovascular Angiography and Interventions, Society of Interventional Radiology, Society of Thoracic Surgeons and Society for Vascular Medicine. J Am Coll Cardiol. 2010;55:e27-9. Erbel R, Aboyans V, Boileau C, et al. 2014 ESC Guidelines on the diagnosis and treatment of aortic diseases: Document covering acute and chronic aortic diseases of the thoracic and abdominal aorta of the adult. The task force for the diagnosis and treatment of aortic diseases of the European Society of Cardiology (ESC). Eur Heart J. 2014;35:2873-926. Boodhwani M, Andelfinger G, Leipsic J, et al. Canadian Cardiovascular Society position statement on the management of thoracic aortic disease. Can J Cardiol. 2014;30:577-89. Goldfinger JZ, Halperin JL, Marin ML, et al. Thoracic aortic aneurysm and dissection. J Am Coll Cardiol. 2014; 64:1725-39. Wong RH, Baghai M, Yu SC, et al. Aortic arch/elephant trunk procedure with Sienna(TM) graft and endovascular stenting of thoraco-abdominal aorta for treatment of complex chronic dissection. Ann Cardiothorac Surg. 2013;2:358-61. Azizzadeh A, Estrera AL, Porat EE, et al. The hybrid elephant trunk procedure: a single-stage repair of an ascending, arch, and descending thoracic aortic aneurysm. J Vasc Surg. 2006;44:404-7. Mizuno T, Toyama M, Tabuchi N, et al. Stented elephant trunk procedure combined with ascending aorta and arch replacement for acute type A aortic dissection. Eur J Cardiothorac Surg. 2002;22:504-9. Chen LW, Dai XF, Lu L, et al. Extensive primary repair of the thoracic aorta in acute type a aortic dissection by means of ascending aorta replacement combined with open placement of triple-branched stent graft: early results. Circulation. 2010;122:1373-8. Coselli JS, Bozinovski J and LeMaire SA. Open surgical repair of 2286 thoracoabdominal aortic aneurysms. Ann Thorac Surg. 2007;83: S862-4. Stone DH, Brewster DC, Kwolek CJ, et al. Stent-graft versus open-surgical repair of the thoracic aorta: mid-term results. J Vasc Surg. 2006;44:1188-97. Preventza O, Garcia A, Cooley DA, et al. Total aortic arch replacement: A comparative study of zone 0 hybrid arch exclusion versus traditional open repair. J Thorac Cardiovasc Surg. 2015;150:1591-8. Bachet J, Teodori G, Goudot B, et al. Replacement of the transverse aortic arch during emergency operations for type A acute aortic dissection. Report of 26 cases. J Thorac Cardiovasc Surg. 1988;96:878-86. Fann JI, Smith JA, Miller DC, et al. Surgical management of aortic dissection during a 30-year period. Circulation. 1995;92:Ii113-21. Ando M, Nakajima N, Adachi S, et al. Simultaneous graft replacement of the ascending aorta and total aortic arch for type A aortic dissection. Ann Thorac Surg. 1994;57:669-76. Kazui T, Kimura N, Yamada O, et al. Total arch graft replacement in patients with acute type A aortic dissection. Ann Thorac Surg. 1994;58:1462-8. Kobuch R, Hilker M, Rupprecht L, et al. Late reoperations after repaired acute type A aortic dissection. J Thorac Cardiovasc Surg. 2012;144:300-7. Liu ZG, Sun LZ, Chang Q, et al. Should the "elephant trunk" be skeletonized? Total arch replacement combined with stented elephant trunk implantation for Stanford type A aortic dissection. J Thorac Cardiovasc Surg. 2006;131:107-13. Sun L, Qi R, Chang Q, et al. Surgery for marfan patients with acute type a dissection using a stented elephant trunk procedure. Ann Thorac Surg. 2008;86:1821-5. Sun L, Qi R, Chang Q, et al. Surgery for acute type A dissection with the tear in the descending aorta using a stented elephant trunk procedure. Ann Thorac Surg. 2009;87:1177-80. Sun LZ, Qi RD, Chang Q, et al. Surgery for acute type A dissection using total arch replacement combined with stented elephant trunk implantation: experience with 107 patients. J Thorac Cardiovasc Surg. 2009;138:1358-62. Uchida N, Shibamura H, Katayama A, et al. Operative strategy for acute type a aortic dissection: ascending aortic or hemiarch versus total arch replacement with frozen elephant trunk. Ann Thorac Surg. 2009;87:773-7. Dong Z, Fu W, Wang Y, et al. Stent graft-induced new entry after endovascular repair for Stanford type B aortic dissection. J Vasc Surg. 2010;52:1450-7. Feng J, Lu Q, Zhao Z, et al. Restrictive bare stent for prevention of stent graft-induced distal redissection after thoracic endovascular aortic repair for type B aortic dissection. J Vasc Surg. 2013;57:44s-52s. Weng SH, Weng CF, Chen WY, et al. Reintervention for distal stent graft-induced new entry after endovascular repair with a stainless steel-based device in aortic dissection. J Vasc Surg. 2013;57:64-71. Nienaber CA, Kische S, Rousseau H, et al. Endovascular repair of type B aortic dissection: long-term results of the randomized investigation of stent grafts in aortic dissection trial. Circ Cardiovasc Interv. 2013;6:407-16. Chang GQ, Li ZL. Endovascular stent-graft placement in Stanford type B aortic dissection in China. Eur J Vasc Endovasc Surg. 2009;37:646-53. Idrees J, Roselli EE, Shafii S, et al. Outcomes after false lumen embolization with covered stent devices in chronic dissection. J Vasc Surg. 2014;60:1507-13. Li M, Shu C, Li QM, et al. Midterm results of intentional celiac artery coverage during TEVAR for type B aortic dissection. J Endovasc Ther. 2013;20:276-82. Idrees J, Arafat A, Johnston DR, et al. Repair of retrograde ascending dissection after descending stent grafting. J Thorac Cardiovasc Surg. 2014;147:151-4.